Oh Jenny Han, you are the queen of teenage romance! I finished P.S. I Still Love You while on a weekend boating trip to the Exumas for a family friend's 14th birthday. I made all the girls promise me they would read The Summer I Turned Pretty series and then this series. Han is so spot-on in her depiction of teenage girls. 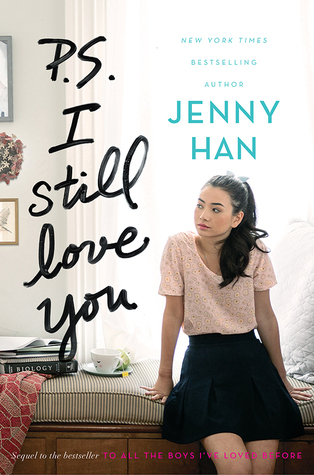 I love that our heroine, Lara Jean, has decided that she is in charge of how far she goes sexually, boyfriend or not. And she decides not to do much, which will be reassuring to girls who feel like everyone else is more experienced than they are. I wished that Lara Jean had a better female friend than Chris, who rarely shows up in this book. On the other hand, she has two incredible sisters, particularly Kitty, who is fun and wise and hilarious. I adore Han's descriptive writing. She uses a lot of similes, but they are so beautiful that I want to remember them as mentor sentences, rather than counting how many there are. You can't fight with sentences like, "I feel like a purse bulging with gold coins. I can't wait to spill." and "Her hair is long, and the ends dip into the hot tub like calligraphy brushes in ink. The boy runs his hands down her spine like she is a cello and he is playing her." I probably won't use that last one with my fifth graders, but there are plenty more to choose from! Since I already told a boat-load of girls they have to read everything Han wrote, now I'm going to say the same to anyone reading this: get PS. I Still Love You now!